The body mass of a male silvered leaf-monkey averages 6.6 kilograms and adult female averages 5.7 kilograms (Fleagle, 1999). Subadult males are about the size of adult females but smaller than fully grown adult males (Bernstein, 1968). The pelage color is a dark gray with the tips of the hairs being paler in color giving it a silvered effect. The groin and the ventral side of the tail are yellowish in coloration (Rowe, 1996). The face is black in coloration and the hair on the head is pointed (Furuya, 1961-2). Adult females have irregular patches of white on the inner portion of the upper thighs (Bernstein, 1968; Furuya, 1961-2). The newborn’s pelage color is orange, with the face, hands, and feet being white (Bernstein, 1968). Infants will darken and the darkening process takes 3-5 months to change to the adult pelage coloration (Bernstein, 1968; Medway, 1970). First the head starts to fade to a yellow orange, then the head, face, hands, feet, and ears turn dark gray and then black (Bernstein, 1968). This species has a sacculated stomach to assist in the breakdown of cellulose. The silvered leaf-monkey has enlarged salivary glands to assist it in breaking down food. The dental formula of this species is 2:1:2:3 on both the upper and lower jaws (Ankel-Simons, 2000). Trachypithecus cristatus cristatus: The overall coloration is a tone of gray with long lightened hair tips (Groves, 2001). A red morph is found in Borneo (Groves, 2001). Trachypithecus cristatus vigilans: This subspecies is darker than the T. c. cristatus subspecies (Groves, 2001). The crown of this subspecies is dark surrounded by a zone of long hair tips (Groves, 2001). Trachypithecus cristatus koratensis: The coloration of this subspecies is a medium gray that is caused by short cream-colored tips on dark gray or brown-black hairs (Groves, 2001). The ventral side, throat, and shanks are cream-colored (Groves, 2001). The hands and feet are black in coloration (Groves, 2001). There is a creamy yellow halo around the face (Groves, 2001). The tail is nearly black on the dorsal side, lighter on the ventral side (Groves, 2001). Trachypithecus cristatus caudalis: The body of this subspecies is dark grading to black to the dorsum (Groves, 2001). The flanks are brown-gray with silvery tips (Groves, 2001). This subspecies has long cheek hairs that are pale yellow in coloration (Groves, 2001). The legs are pale yellow on the outside (Groves, 2001). The tail is black on the dorsal side with a yellow stripe on the ventral side (Groves, 2001). *Trachypithecus cristatus koratensis is called Trachypithecus germaini germaini and Trachypithecus cristatus caudalis is called Trachypithecus germaini caudalis by Groves (2001). 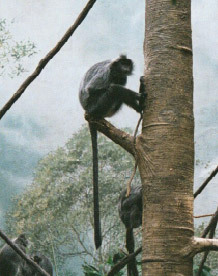 The silvered leaf-monkey is found in the countries of Brunei, Burma, Cambodia, Indonesia, Laos, Malaysia, Thailand, and Vietnam (Bernstein, 1968; Fooden, 1976; Ruggeri and Timmons, 1995/1996). On the Malay Peninsula this species is found on the west coast in an area between Province Wellesley and Malacca State (Furuya, 1961-2). In Vietnam this species is found in the south from Kontum to Tay Ninh province (Le, 1996/1997). This species lives in a variety of forest types including, primary and secondary growth forests, riverine forests, mangrove forests, swamp forests, and coastal forests (Furuya, 1961-2; MacKinnon and MacKinnon, 1987). In Laos the silvered langur has been found in lowland riverine, degraded, and mosaic habitats (Ruggeri and Timmons, 1995/1996). At Kanchamburi, Thailand, this species lives in evergreen forests (Bennett and Davies, 1994). Trachypithecus cristatus cristatus: This subspecies occurs on Sumatra, some islands in the Riau Archipelago, Bangka, Belitung, Borneo, and the western coast of peninsular Malaysia (Groves, 2001). Trachypithecus cristatus vigilans: This subspecies occurs on the Natuna Islands (Groves, 2001). Trachypithecus cristatus koratensis: This subspecies is found in Burma, southeastern Thailand including Koh Chang as far north as Loei, Cambodia, and southern Vietnam (Groves, 2001). Trachypithecus cristatus caudalis: This subspecies is found in northern Vietnam (Groves, 2001). The silvered leaf-monkey is a folivorous species, but this species also consumes fruits, seeds, flowers, and young shoots (Bernstein, 1968; Furuya, 1961-2). Young leaves and leaf buds are selected from leaves of trees and leaves of any age are selected from ground plants and vines (Bernstein, 1968). Orchid flowers and dried wood were observed to be consumed by the silvered langur (Bernstein, 1968). This species prefers to eat immature leaves over more mature ones because they contain less lignin and tannins. Clay is eaten by scraping the teeth along a clay outcrop (Bernstein, 1968). Group sizes range from 9 to 51 individuals. Furuya (1961-2) found that group sizes range from 22-48 individuals. This is an arboreal and diurnal species. This species will come to the ground, but only to move between certain areas (Bernstein, 1968). Travel is sometimes initiated and coordinated by the adult male, sometimes using the kwah vocalization (Bernstein, 1968). The group will start moving shortly before sunrise (Bernstein, 1968). This species will also travel right before it becomes dark out, with all of the group members retreating to a single tree to sleep at night (Bernstein, 1968). Rest differs from sleep in that it is individual, with having a peak during the day in the late morning (Bernstein, 1968). When resting, juveniles and infants stay close to adult females (Furuya, 1961-2). 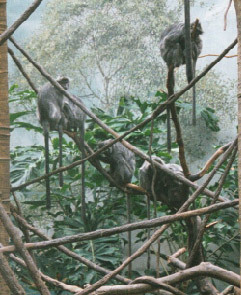 The silvered leaf-monkey moves through the forest quadrupedally (Fleagle, 1988; Furuya, 1961-2). The silvered leaf-monkey has a unimale social structure. The group is composed of a single adult male, several adult females, and immature individuals (Wolf and Fleagle, 1977). Males will live solitarily before finding a group of its own (Bennett and Davies, 1994). The groups are highly territorial and will act aggressively towards other individuals (Bernstein, 1968). Males will keep other group males out of the range of the group (Bernstein, 1968; Furuya, 1961-2). Conflicts will usually occur at the areas of home range overlap (Bernstein, 1968). Conflicts usually consist of chasing and/or fighting between the resident males (Bernstein, 1968). Adult males will move rapidly amongst the group and emit loud vocalizations when two neighboring groups come together (Bernstein, 1968). Other members of the group will squeal and embrace each other during group conflicts (Bernstein, 1968). Fighting consists of slapping and pulling with some biting (Bernstein, 1968). Intragroup agonistic behavior is rare in the silvered langur (Bernstein, 1968). Males disperse from their natal group. Infanticide has been reported to occur in this species (Wolf and Fleagle, 1977; Wolf, 1980). Infanticide results from an adult male coming into the group, killing the resident adult male, and killing the infants dependent on their mothers so that the adult females will begin to ovulate again (Wolf and Fleagle, 1977). An adult male that takes over a group will also chase out the immature males of the group (Wolf and Fleagle, 1977). Females allow other females to carry and to care for their young (allomothering) (Fleagle, 1988). Adult males have also been observed to carry and care for immature group members (Bernstein, 1968). Usually when adult males carry young, the young initiate the behavior and the adult males are passive (Bernstein, 1968). Females will carry infants ventrally (Bernstein, 1968). Infants or juveniles that fall to the ground are retrieved by juveniles or adult females (Bernstein, 1968). 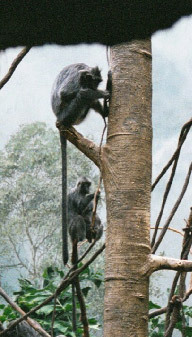 Social play in the silvered langur mostly occurs amongst juveniles of both sexes and infants, but individuals of all ages and both sexes have been found to participate (Bernstein, 1968). Wrestling is the most common form of play with locomotor play also found (Bernstein, 1968). Locomotor play includes repeated circuits along a pathway where individuals will swing from branches or drop to the ground from branches (Bernstein, 1968). Juvenile males engage in the most vigorous forms of play fighting, and they will sometimes play fight with subadult males (Bernstein, 1968). ku: This call is emitted by infants when they are in a peaceful state (Furuya, 1961-2). This call is also uttered by juveniles when addressing each other from a short distance (Furuya, 1961-2). ho: This call is emitted by young males and females when addressing each other from a short distance (Furuya, 1961-2). ku-ku: This call is uttered by adult females when greeting each other (Furuya, 1961-2). kwah: This call is emitted by the adult male in order to control group travel movement (Bernstein, 1968). This call is emitted at repeated intervals (Bernstein, 1968). squeal: This call is most often emitted by juveniles and infants (Bernstein, 1968). This call sounds like "ki" or "gyu" (Furuya, 1961-2). territorial call: This is a two note inhale-exhale type vocalization that is used by adult males during and after territorial conflicts (Bernstein, 1968). alarm call: This call sounds like "snick" (Bernstein, 1968). Furuya (1961-2) found that there are three different sounds associated with an alarm call: "cha-cha', "chue-chue", and "ge-ge". fear call: This call sounds like "kie" (Furuya, 1961-2). This call expresses fear or surprise (Furuya, 1961-2). threat call: This call sounds like "guu" or "gyu" (Furuya, 1961-2). This call is emitted by adult males (Furuya, 1961-2). This call serves to communicate threat on the part of the sender (Furuya, 1961-2). attack call: This call sounds like "gua-gua-gua" (Furuya, 1961-2). This call is emitted by adult males when attacking an intruder (Furuya, 1961-2). yawning: This behavior is used to communicate tension or general excitement on the part of the sender (Bernstein, 1968). branch shaking: This behavior is used to communicate tension or general excitement on the part of the sender (Bernstein, 1968). chasing: This is when one individual will chase another for a given distance. The silvered langur will do this when there are disputes at areas of group territory overlap, with the male usually performing this behavior (Bernstein, 1968). An adult male will chase the other male out of the territory, but when they reach the other group's territory a reversal will occur where the one who was chasing is now being chased (Bernstein, 1968). head-shaking: This is where the female shakes her head back and forth before she presents to the male (Bernstein, 1968). presenting: This behavior is performed by the female to elicit a copulation from the male; this pattern tells the male that she is ready for copulation. Head-shaking precedes this display. social grooming: This is when one individual grooms another and is used to reinforce the bonds between individuals. All group members participate in social grooming (Bernstein, 1968). Three or four individuals may groom in a chain or two individual may simultaneously groom a third (Bernstein, 1968). Grooming is often reciprocal, where two individuals groom each other, but not necessarily at the same time (Bernstein, 1968). embracing: This behavior is seen when there is distress amongst group members (Bernstein, 1968). This behavior can occur with squeal (Bernstein, 1968). The silvered leaf-monkey gives birth to a single offspring. This species has not been found to have a birth season, with births occurring throughout the year (Medway, 1970). A typical sexual encounter will begin with the female making rhythmic side-to-side movements and then presenting and head shaking towards the male (Bernstein, 1968). A male will not always mount a female that is performing solicitation behavior, but when a male does mount, the mounts are multiple in frequency (Bernstein, 1968). If two females solicit a male simultaneously, both females will be mounted (Bernstein, 1968). If a male moves away from a soliciting female, the female will reorient towards the male (Bernstein, 1968). Bennett, E.L. and Davies, A.G. 1994. The ecology of Asian colobines. in Colobine Monkeys: Their Ecology, Behaviour and Evolution. eds. A.G. Davies and J.F. Oates. Cambridge University Press: Cambridge. Fleagle, J. G. 1999. Primate Adaptation and Evolution. Academic Press: San Diego. Fooden, J. 1976. Primates obtained in peninsular Thailand June-July, 1973, with notes on the distribution of continental Southeast Asian leaf-monkeys (Presbytis). Primates. Vol. 17(1), 95-118. Furuya, Y. 1961-2. The social life of silvered leaf monkeys. Primates. Vol. 3(2), 41-60. Le, X.C. 1996/1997. Endangered primate species in Vietnam. Primate Conservation. Vol. 17, 117-126. MacKinnon, J. and MacKinnon, K. 1987. Conservation status of the primates of the Indo-Chinese subregion. Primate Conservation. Vol. 8, 187-195. Medway, Lord. 1970. Breeding of the silvered leaf monkey, Presbytis cristata, in Malaya. Journal of Mammalogy. Vol.51(3), 630-632. Ruggeri, N. and Timmins, R.J. 1995/1996. An initial summary of diurnal primate status in Laos. Asian Primates. Vol. 5(3/4), 1-3. Wolf, K. 1980. Social Change and Male Reproductive Strategy in Silvered Leaf-monkeys, Presbytis cristata, in Kuala Selangor, Peninsular Malaysia. American Journal of Physical Anthropology, 52, 294. Last Updated: October 15, 2003.